Constructivist buildings have often been compared to ships — ocean liners, dreadnoughts, even spaceships — in terms of their external appearance. This is perhaps not surprising, of course. In his groundbreaking 1923 text Toward an Architecture, the Swiss architect Le Corbusier famously exhorted his colleagues to abandon the historical “styles” and instead emulate the design of modern machines. Biplanes, luxury vessels and automobiles represent a clearer response to the demands of present-day construction, he insisted, than the Parthenon or St Peter’s Basilica. “A serious architect will find in the liner a liberation from cursed enslavement to the past,” wrote Corbusier. Moisei Ginzburg, chief theorist of the Soviet constructivist group OSA (the Association of Modern Architects) and a leading proponent of Corbusian ideas in Russia, tacitly echoed this sentiment in his own treatise, Style and Epoch, published in 1924. On the very first page there is an illustration of the heavily armoured German warship SMS Nassau, soon followed by pictures of Kraus locomotives and Ansaldo aircraft. Ginzburg’s associate Karel Teige, a Czech poet and architecture critic sympathetic to international Constructivism, thus similarly advocated an “architecture in which buildings are constructed in the same way as railway cars, transatlantic ships, automobiles, and machines”. Perhaps the resemblance between Constructivist architecture and modern cruisers is not such a coincidence after all. It is by now a well-worn cliche that Russia’s second city lagged behind Moscow when it came to modern architecture. 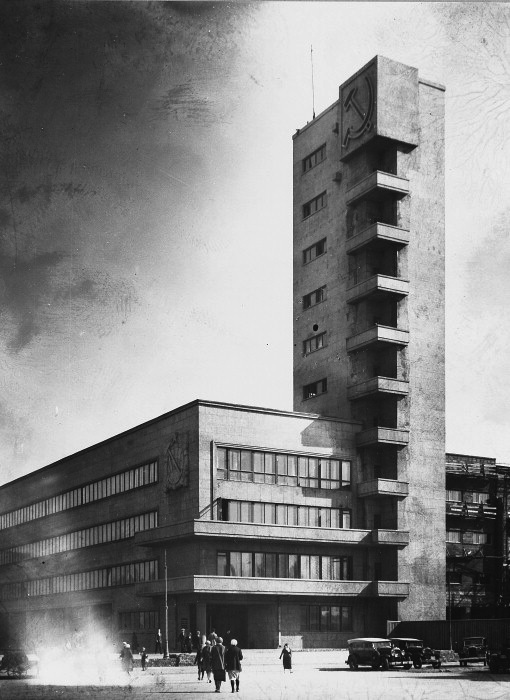 Still, by the mid-1920s a vibrant architectural avant-garde had asserted itself in Leningrad, with the young troika of Alexander Nikolsky, Grigory Simonov and Alexander Gegello leading the way. 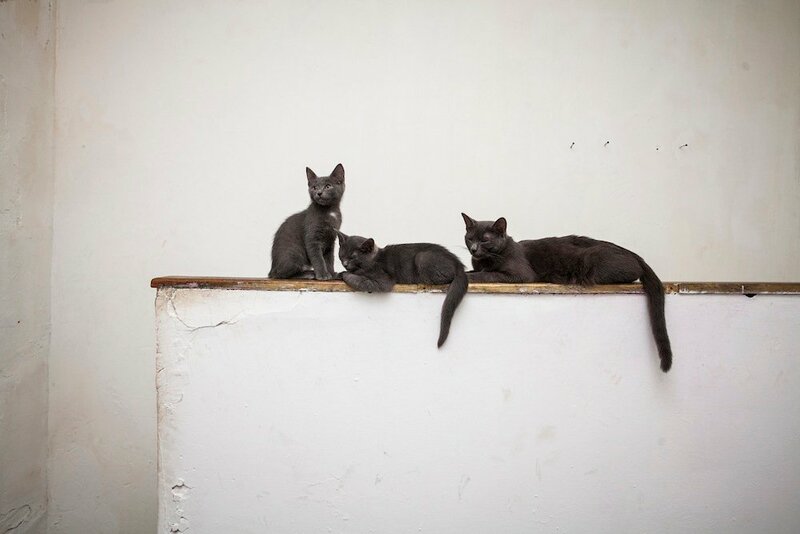 At the same time the movement found pedagogical support in the GINKhUK (the State Institute of Artistic Culture), established in 1923, where the Suprematist master Kazimir Malevich began teaching with two of his most gifted proteges, Yakov Chernikhov and Lazar Khidekel. By the end of the decade, though, Noi Trotsky had emerged as the city’s premier architect, winning a number of competition prizes. Kirikov is unreserved in his estimation of Trotsky, calling him “the most brilliant figure of the last stage of the Leningrad avant-garde”. 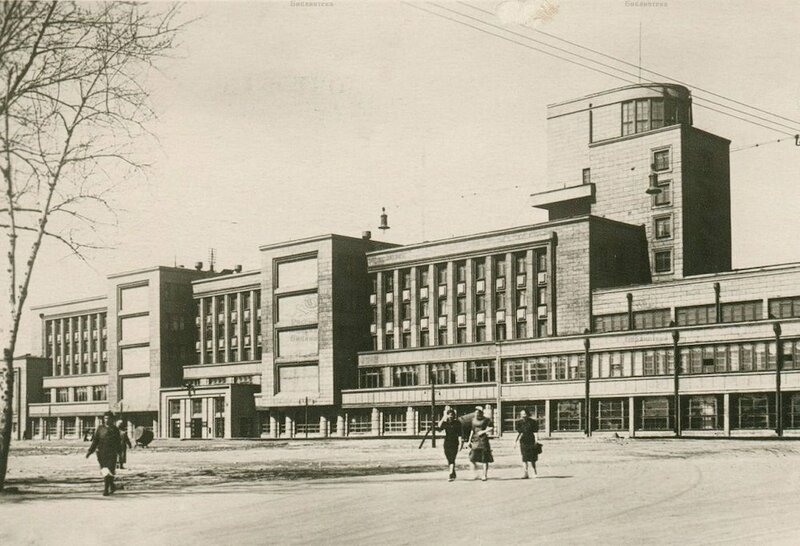 Trotsky’s first major project was the Kirovsky District Council Office in Stachek Square, located in mainland St Petersburg, not far from the historic suburb of Yekateringof. Here he introduced one of his trademark signatures of design: a colossal tower more than double the height of the rest of the structure. In the case of the Kirovsky District Council Office building, the tower stands over 50 metres tall. Such sudden verticality contrasts sharply with the horizontalism of the main section, which stretches out asymmetrically the length of a city block. Exploiting the “ribbon window” motif developed by Ginzburg and Ignaty Milinis at Narkomfin in Moscow, Trotsky further accentuated this perpendicular tension by adding long, narrow strips of glazing along the base. The denticulated balconies attached to the tower allow it to serve as a kind of observation deck overlooking the adjacent plaza, almost akin to the crow’s nest on older frigates. Make no mistake, however: the Kirovsky District Council Office is most reminiscent of a modern liner (albeit one heavily loaded to the aft), about to set sail toward the Tarakanovka streamlet and out into the surrounding bay. 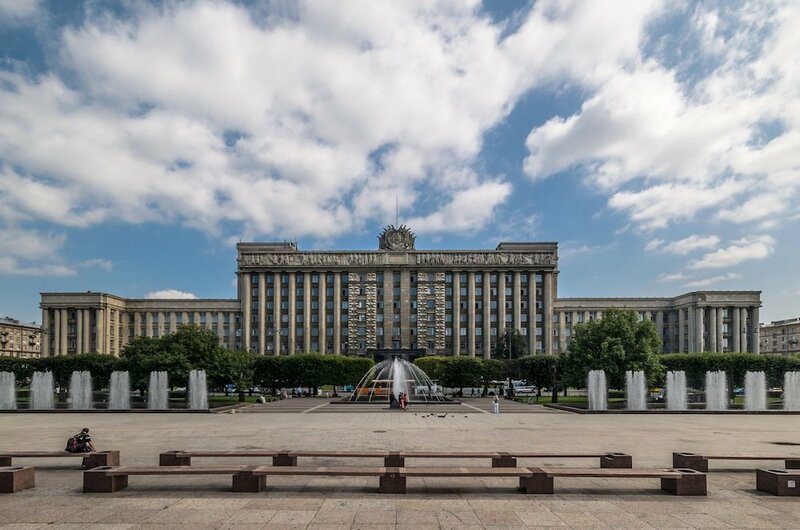 Each of these three buildings, the reader may have noticed, bears the name Kirov, after the Leningrad party boss whose assassination in 1934 served as the occasion for Stalin’s purging of the Old Bolsheviks. None of them — not the District Council Office, the Palace of Culture or the Meat-Packing Plant — was originally dedicated to his memory, as all were started before he died. Like nearly everything else of significance in the city, of course, these were renamed afterward to honour him. Despite his impressive architectural accomplishments, Trotsky himself would not escape persecution during these years. On the whole, architects suffered less during the purges than did visual artists or literary figures, the murder of Constructivist urbanist Mikhail Okhitovich notwithstanding. But this tendency did not save Trotsky from several run-ins with the NKVD (the forerunner to the KGB) and a brief stay in St Petersburg’s Kresty Prison before his untimely death, from illness, in 1940. In this respect, at least, Trotsky is not so very different from the famous revolutionary leader with whom he shared a surname (although here again there is no direct relation: Leon’s original family name was Bronshtein). Both men were born to Jewish families in the twilight of the Russian Empire (Noi in St Petersburg, Leon in southern Ukraine); both fell under Stalin’s suspicion and perished the same year. If Leon seems to offer a political alternative to Stalin, Noi seems to offer an architectural one. History does not deal in counterfactuals, and so such speculation is bound to be merely hypothetical. The German Marxist critic Ernst Bloch, an erstwhile supporter of Stalin, once remarked of modern buildings that they “look as if they were ready to travel”, as if expressing a farewell. He continued: “[Their] interior is bright and sterile like hospital rooms, the exterior looks like boxes on top of mobile poles, but also like ships. They have flat decks, portholes, gangways, railings; they shine white and to the south, and as ships they like to disappear.” Of course, Bloch had in mind the escape of modern architecture from the rising tide of fascism in Europe. But the same may easily be said of Stalin’s Russia. 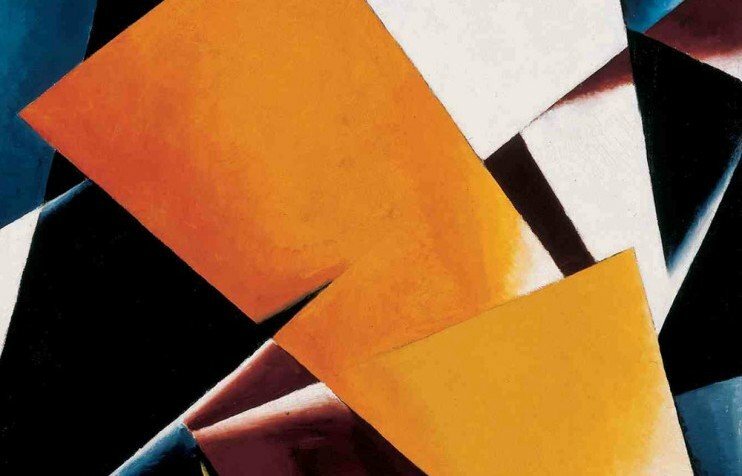 After all, it was there that many European modernists fled during the early 1930s — Ernst Meyer, Mart Stam, Hannes Meyer, André Lurçat, and Margarete Schütte-Lihotzky, to name a few. Invited by the Soviet government in 1930, the last of them were forced to leave in 1937, as all foreign specialists were expelled. They scattered to the Americas, to Palestine and elsewhere. Fittingly, the last of Noi Trotsky’s three constructivist masterpieces in Leningrad went up around that same time. Noi is the Russian version of the biblical name Noah, and Trotsky seemed to have already sensed the coming storm. His buildings looked like giant boats ready to depart. Yet they remained stationary, rooted where they are looking as if they crashed ashore while on a voyage from some distant century that never fully happened. With the Kirov Palace of Culture on Vasileostrovsky Island, the similarities between the building and the ships passing nearby through the Neva are even more pronounced. In collaboration with the architect Solomon Kozak, construction began in early 1931 and continued straight through 1933, when one wing of the palace was completed and opened to the public. Building proceeded in stages after this point, until it was finished in late 1937. For the most part, the structure remains at an even height of five storeys. Pylons interrupt the broad plates of sheet glass that line the ground floor, not unlike the Kirovsky District Council Office. Each structure seems to “float” or levitate just above the Earth’s surface. 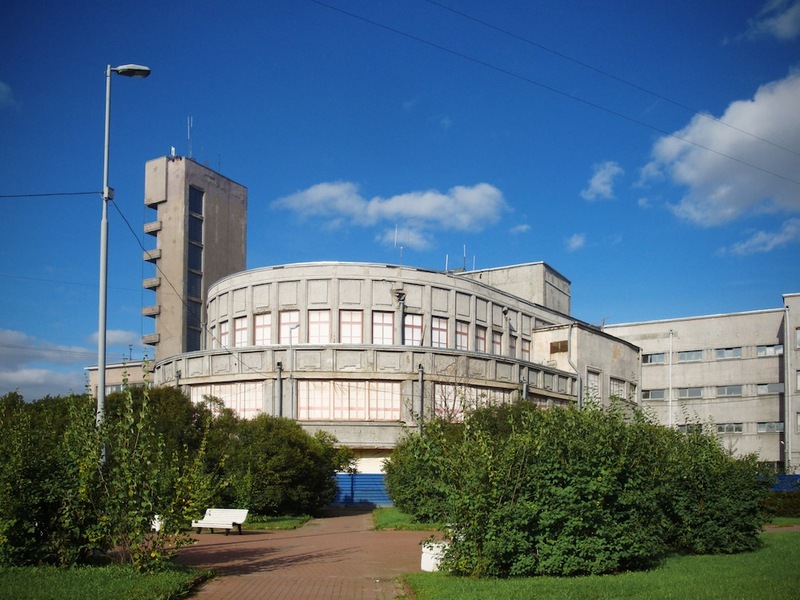 Kirikov is right, moreover, to point out the influence of the German Expressionist architect Erich Mendelsohn on Trotsky and Kozak in the rounded shape of the building’s tower. 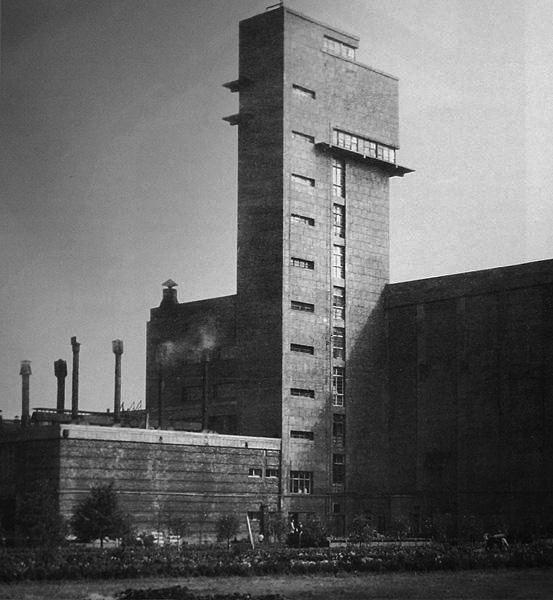 Mendelsohn had been commissioned to design the Red Banner Textile Factory in Leningrad in 1926; its impact on the local avant-garde was immediate and decisive. The tower Trotsky and Kozak included in the Kirov Palace of Culture is almost identical. In both instances, the looming superstructure could easily be substituted for that of a battleship. At any rate, the proportions were not far off. Dreadnoughts normally carried crews of around 2,500 men, but accommodations could be made for up to 12,000. The Kirov Palace of Culture had a holding capacity of 10,000. 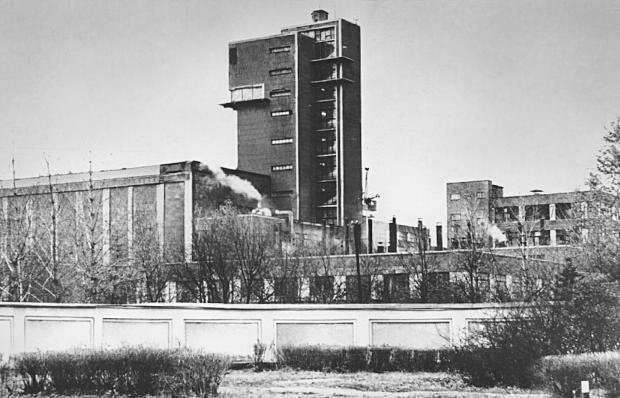 Finally, the Kirov Meat-Packing Plant was built over a comparatively short timespan. This might have been due to the more pressing need for its services, so that it took priority over the administrative functions of the Kirovsky District Council office and the cultural functions of the Kirov Palace of Culture. Begun in 1931, the factory opened its doors just two years later, in 1933. Trotsky drew up the plans in conjunction with R Zelikman and B Svetlitsky, for which the group would later be awarded a gold medal at the 1937 World’s Fair in Paris. 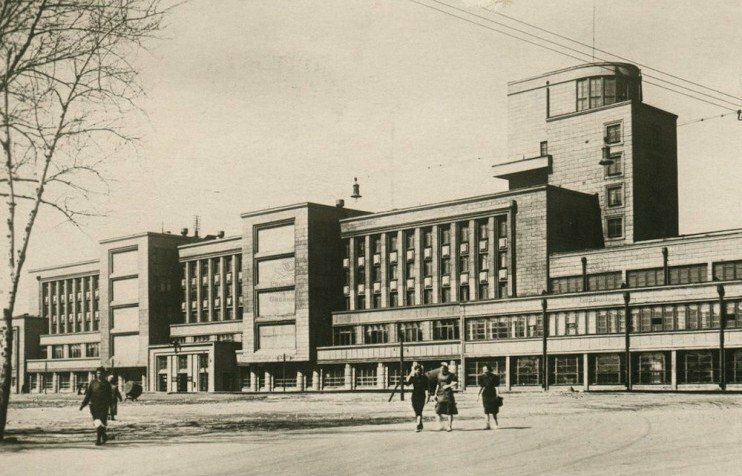 Of the three buildings examined here, the Kirov Meat-Packing Plant is probably most like a building and least like a ship. Compared to the other two, the plant is considerably bulkier. Its layout shares their geometric orthogonality, but the massing is packed together much more tightly. Part of this owes to the extraordinary technological demands of the facility, as it would require an enormous amount of refrigerated storage space and coordinated multilevel platforms for the slaughterhouse. Some ship-like elements do appear, however, in the cambered horizontal windows (traditionally employed to match the ship’s curvature) inside the plant’s iconic 42-metre tower. Now, none of Trotsky's creations is thriving. The District Council Office is still functioning, but the adjacent Progress Cinema is closed for renovation. 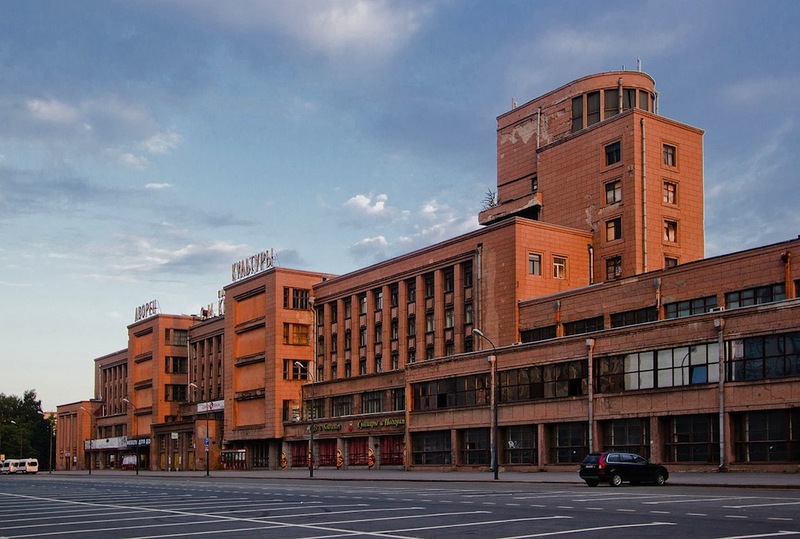 The Meat-Packing Plant, which has been at the centre of corruption scandals, is legally protected but under threat as production there falters; the famous tower is completely abandoned. The Palace of Culture has been derelict for over a decade, the roof of the great main hall having collapsed. 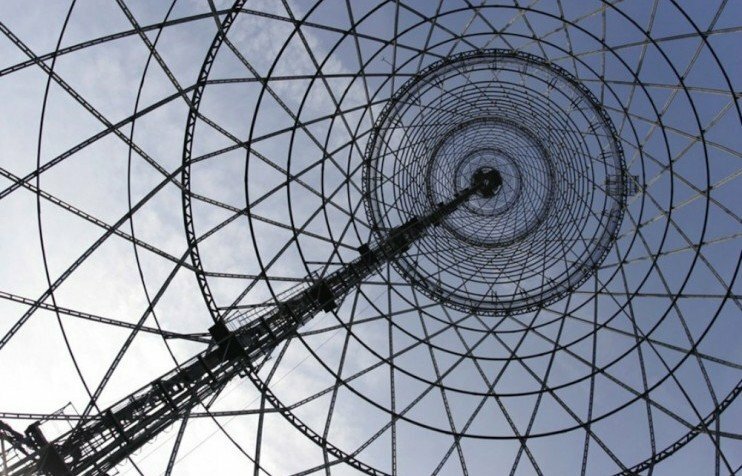 Modern matter: Owen Hatherley asks, what does Constructivism mean today?